Cedr will give you your favourite bleeps and bloops. 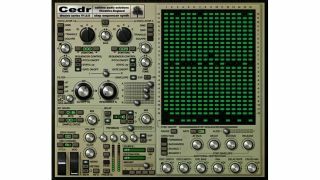 Drzewo Cedr (Cedar Tree) is a new Windows 32-bit VST plugin synth from freeware developer Saltline, and could be ideal for any chiptune lovers who are looking to fry a few circuits. Let's start at the start - it looks like you can mix between two oscillators (Sine/Saw/Triangle/Square) and dial in pulse-width modulation and tuning for each. A filter (LP/HP/BP) comes next (with envelope in tow) before bitcrushing and delay are applied. You also get an amplitude envelope (ADSR), and five slots for routing MIDI control functions such as velocity, aftertouch, etc. Comprehensive synthesis functionality, then, but Drzewo Cedr's right-hand side is where things starts getting creative. The 16-step sequencer gives you control over note triggering and pitch, and you can set rate, movement (forwards/backwards/bounce) and glide parameters, as well as taking control over the per-step amplitude envelope. LFOs are substituted, in true chip-synth style, with sequencer destinations such as pulse width and oscillator mix. Check out the Saltline website, where you can download Cedr and find more free synths and effects.